Workflow changes and reporting requirements are just two of the issues providers must confront on the path to incentive-hood. The HITECH Act of the American Recovery and Reinvestment Act (ARRA) allocates more than $17 billion in the form of Medicare and Medicaid incentives to accelerate EHR adoption. Beginning in 2011, hospitals, eligible professionals (EPs; ie, non–hospital-based physicians), and critical access hospitals may receive funding to adopt, implement, or upgrade certified EHR technology—provided they can demonstrate meaningful use of the technology. On December 30, 2009, the Centers for Medicare & Medicaid Services (CMS) released the proposed rule that defines meaningful use, lists criteria for demonstrating meaningful use, and describes the calculation of incentive payments, as well as penalties for failing to meet meaningful use criteria. The CMS’ definition of meaningful use is divided into three stages. Stage 1, which begins in 2011, includes 23 objectives and measures for eligible hospitals and 25 objectives and measures for EPs that must be met. Details of stages 2 and 3, which will phase in more robust criteria, are still being worked out. Hospitals and physicians that want to collect incentives in 2011 need to demonstrate meaningful use according to stage 1 criteria by July 1, 2011, and October 1, 2011, respectively. What Data Must Be Collected? Stage 1 meaningful use criteria expect hospitals and EPs to electronically capture health information in a coded format, use the information to track key clinical conditions and communicate the information to coordinate care, implement clinical decision-support tools, and report clinical quality measures and public health information. • Eligible hospitals use computerized physician order entry (CPOE) for at least 10% of all orders; EPs use it for at least 80% of all orders. • Apply clinical decision support at the point of care. Generate lists of patients who need care and use them to reach out to patients. Maintain an up-to-date problem list of current and active diagnoses. At least 80% of all patients seen by the EP or admitted to the hospital have at least one entry or an indication of “none” recorded as structured data. • Report information for quality improvement and public reporting. 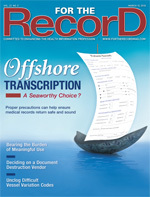 Transmit at least 75% of all permissible prescriptions written by the EP electronically using certified EHR technology. Maintain active medication and medication allergy lists. In each case, at least 80% of all patients seen by the EP or admitted to the hospital have at least one entry (or an indication of none if the patient is not currently prescribed any medication or has no medication allergies) as structured data. • Record and chart changes in vital signs. For at least 80% of all patients aged 2 and older seen by the EP or admitted to the hospital, record blood pressure and body mass index. Additionally, plot growth chart for children aged 2 to 20. • Record smoking status for at least 80% of all patients aged 13 and older. • Incorporate clinical lab test results into the EHR as structured data. At least 50% of all clinical lab tests ordered with results in a positive/negative or numerical format are incorporated in certified EHR technology as structured data. • Send preventive/follow-up care reminders to at least 50% of patients aged 50 and older. • Implement five clinical decision-support rules relevant to the clinical quality metrics for which the EP or hospital is responsible. • Provide clinical summaries for at least 80% of all office visits. • Exchange meaningful clinical information among the professional healthcare team. Perform at least one test of the certified EHR technology’s capacity to electronically exchange key clinical information. • Conduct or review a security risk analysis and implement security updates as necessary. Where to Begin? Who’s Responsible? In 2012, the CMS has proposed requiring the direct submission of clinical quality measures to the CMS (or to the states for Medicaid EPs and hospitals) through certified EHR technology. The CMS is aware that the infrastructure to support the electronic exchange of structured information is not yet available in many parts of the country. For this reason, it has excluded the exchange of structured information from many stage 1 criteria or set relatively low performance thresholds for measures that do rely on the electronic exchange of structured data. The threshold will be raised for stage 2 and 3 criteria as the capabilities of HIT infrastructure increase. The intent and policy goal of raising the thresholds is to encourage patient-centric, interoperable health information exchange across provider organizations. Complementing the proposed rule defining meaningful use, the Office of the National Coordinator of Health Information Technology (ONCHIT) has issued an interim final rule that specifies the adoption of an initial set of standards, implementation specifications, and certification criteria for EHRs. The ONCHIT will also issue certification criteria and processes to guide EHR vendors in configuring their systems.